What is Retro? A Copy of Vintage. The Vogue pattern below is a recent Vogue Pattern (current), but fashioned after an old vintage pattern (original from 1950's in this case). This particular pattern shows a copy of the original pattern (right), and a photo of the recent pattern (left). On top of that, the fabric on the photo of the current dress (left), is not only retro, in that it copies vintage, but is made out of an old fashioned looking material too. 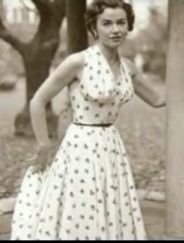 So in this case the dress is retro and vintage inspired. This pattern is considered vintage, because it is an original pattern from between 1920 and 1980.
" What is retro " is not a question that needs to be answered much anymore, but for those that would like the technical answer for " What is Retro ", here it is. Wikipedia’s definitions of vintage clothing is " A generic term for new or second hand garments originating from a previous era". The phrase is also used in connection with a retail outlet, e.g. 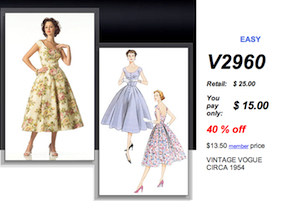 "vintage clothing store." 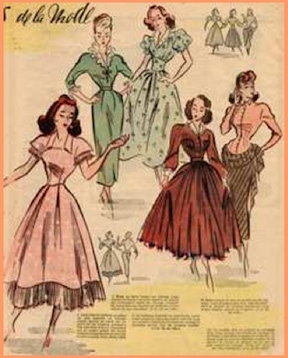 It can also be used as an adjective: "This dress is vintage". "The word vintage is copied from its use in wine terminology, as a more elegant-seeming euphemism for "old" clothes. Most vintage clothing has been previously worn, but a small percentage of pieces have not. These are often old warehouse, or shop stock. These items are usually referred to by dealers as "dead stock", "old stock" or "new-old stock" and can be more sought after and more valuable than those that have been worn, especially if they have their original tags. Wikipedia’s definition of What is RetroRetro is a term used to describe, denote or classify culturally outdated or aged trends, modes, or fashions, from the overall postmodern past, but have since that time become functionally or superficially the norm once again. The use of "retro" style iconography and imagery interjected into post-modern art, advertising, mass media, etc. has occurred from around the time of the industrial revolution to present day. What is Retro or Vintage Inspired is a newly designed garment with some elements of the original, or made to look like vintage clothing. Looks old, but it’s new. Maybe only one element is retro or vintage inspired, such as the collar or the buttons. In the case of vintage the fabric might look aged and faded or have a pattern common in the good old days. Home Page Back to Top - What is Retro?